Mother Teresa's devotional work among the poor and dying of India won her the Nobel Prize for Peace in 1979. She is also known as the founder of the only Catholic religious order still growing in membership. 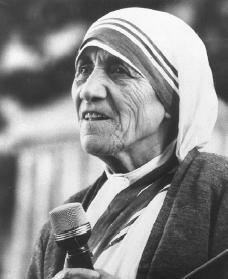 Mother Teresa of Calcutta was born Agnes Gonxha Bojaxhiu in Skopje, Macedonia, on August 27, 1910. At the time of her birth Skopje was located within the Ottoman Empire, a vast empire controlled by the Turks in the fifteenth and sixteenth centuries. Agnes was the last of three children born to Nikola and Dranafile Bojaxhiu, Albanian grocers. When Agnes was nine years old, her happy, comfortable, close-knit family life was upset when her father died. She attended public school in Skopje, and first showed religious interests as a member of a school society that focused on foreign missions (groups that travel to foreign countries to spread their religious beliefs). By the age of twelve she felt she had a calling to help the poor. This calling took sharper focus through Mother Teresa's teenage years, when she was especially inspired by reports of work being done in India by Yugoslav Jesuit missionaries serving in Bengal, India. When she was eighteen, Mother Teresa left home to join a community of Irish nuns, the Sisters of Loretto, who had a mission in Calcutta, India. She received training in Dublin, Ireland, and in Darjeeling, India, taking her first religious vows in 1928 and her final religious vows in 1937. One of Mother Teresa's first assignments was to teach, and eventually to serve as principal, in a girls' high school in Calcutta. Although the school was close to the slums (terribly poor sections), the students were mainly wealthy. In 1946 Mother Teresa experienced what she called a second vocation or "call within a call." She felt an inner urging to leave the convent life (life of a nun) and work directly with the poor. In 1948 the Vatican (residence of the pope in Vatican City, Italy) gave her permission to leave the Sisters of Loretto and to start a new work under the guidance of the Archbishop of Calcutta. To prepare to work with the poor, Mother Teresa took an intensive medical training with the American Medical Missionary Sisters in Patna, India. Her first venture in Calcutta was to gather unschooled children from the slums and start to teach them. She quickly attracted both financial support and volunteers. In 1950 her group, now called the Missionaries of Charity, received official status as a religious community within the Archdiocese of Calcutta. Members took the traditional vows of poverty, chastity (purity), and obedience, but they added a fourth vow—to give free service to the most poor. The Missionaries of Charity received considerable publicity, and Mother Teresa used it to benefit her work. In 1957 they began to work with lepers (those suffering from leprosy, a terrible infectious disease) and slowly expanded their educational work, at one point running nine elementary schools in Calcutta. They also opened a home for orphans and abandoned children. Before long they had a presence in more than twenty-two Indian cities. Mother Teresa also visited other countries such as Ceylon (now Sri Lanka), Australia, Tanzania, Venezuela, and Italy to begin new foundations. Mother Teresa's group continued to expand throughout the 1970s, opening new missions in places such as Amman, Jordan; London, England; and New York, New York. She received both recognition and financial support through such awards as the Pope John XXIII Peace Prize and a grant from the Joseph Kennedy Jr. Foundation. Benefactors, or those donating money, regularly would arrive to support works in progress or to encourage the Sisters to open new ventures. By 1979 Mother Teresa's groups had more than two hundred different operations in over twenty-five countries around the world, with dozens more ventures on the horizon. The same year she was awarded the Nobel Prize for Peace. In 1986 she persuaded President Fidel Castro (1926–) to allow a mission in Cuba. The characteristics of all of Mother Teresa's works—shelters for the dying, orphanages, and homes for the mentally ill—continued to be of service to the very poor. In 1988 Mother Teresa sent her Missionaries of Charity into Russia and opened a home for acquired immune deficiency syndrome (AIDS; an incurable disease that weakens the immune system) patients in San Francisco, California. In 1991 she returned home to Albania and opened a home in Tirana, the capital. At this time there were 168 homes operating in India. Despite the appeal of this saintly work, all commentators remarked that Mother Teresa herself was the most important reason for the growth of her order and the fame that came to it. Unlike many "social critics," she did not find it necessary to attack the economic or political structures of the cultures that were producing the terribly poor people she was serving. For her, the primary rule was a constant love, and when social critics or religious reformers (improvers) chose to demonstrate anger at the evils of structures underlying poverty and suffering, that was between them and God. In the 1980s and 1990s Mother Teresa's health problems became a concern. She suffered a heart attack while visiting Pope John Paul II (1920–) in 1983. She had a near fatal heart attack in 1989 and began wearing a pacemaker, a device that regulates the heartbeat. In March 1997, after an eight week selection process, sixty-three-year-old Sister Nirmala was named as the new leader of the Missionaries of Charity. Although Mother Teresa had been trying to cut back on her duties for some time because of her health, she stayed on in an advisory role to Sister Nirmala. Mother Teresa celebrated her eighty-seventh birthday in August, and died shortly thereafter of a heart attack on September 5, 1997. The world grieved her loss and one mourner noted, "It was Mother herself who poor people respected. When they bury her, we will have lost something that cannot be replaced." In appearance Mother Teresa was both tiny and energetic. Her face was quite wrinkled, but her dark eyes commanded attention, radiating an energy and intelligence that shone without expressing nervousness or impatience. Conservatives within the Catholic Church sometimes used her as a symbol of traditional religious values that they felt were lacking in their churches. By most accounts she was a saint for the times, and several almost adoring books and articles started to canonize (declare a saint) her in the 1980s and well into the 1990s. She herself tried to deflect all attention away from what she did to either the works of her group or to the God who was her inspiration. The Missionaries of Charity, who had brothers as well as sisters by the mid-1980s, are guided by the constitution Mother Teresa wrote for them. They have their vivid memo ries of the love for the poor that created the phenomenon of Mother Teresa in the first place. The final part of her story will be the lasting impact her memory has on the next generations of missionaries, as well as on the world as a whole. Egan, Eileen. Such a Vision of the Street. Gar den City, NY: Doubleday, 1985. Le Joly, Edward. Mother Teresa of Calcutta. San Francisco, CA: Harper & Row, 1983. Mother Teresa. In My Own Words. Liguori, MO: Liguori Publications, 1996. Muggeridge, Malcolm. Something Beautiful for God. New York: Walker and Company, 1984. Spink, Kathryn. Mother Teresa: A Complete Authorized Biography. San Francisco: Harper San Francisco, 1997. She is such an inspiration. We should all try to me more like Mother Theresa. Mother Teresa, you will for ever be remembered for your gemerousity and your concerns for the poor. I love her dogedness. Mother teresa was nor distracted with the challenge of loosing her father at that tender age. She was very hard working and prayerful person. She is considered to be brilliant and brave. She stands for what she believes in. She gave her entire life in ty service of humanity. What torched me most is her commitment even in her deteriorating state of health. She was still able to play advisory role in expense to her health. She gave up her last breath with the challenges of the less privilege in her heart. I love her and would like to follow her footsteps. God give me the grace to follow her example. Was this biography written by a man? Why is everything mansplained? Mother Teresa you will never be forgotten by anyone you will always stay in my heart no matter what happens I still look up to you. Like God has always been there for us you have too i always treat you like God. When you were in the challenge of loosing your father I was proud of you for being brave all of us in the world are proud of you for being the Mother of the poorest poorest in the whole entire world! We should all strive to be like Mother Teresa, the world would be better that way.